The Pratt & Whitney R-2800 Double Wasp is an American twin-row, 18-cylinder, air-cooled radial aircraft engine with a displacement of 2,800 in³ (46 L), and is part of the long-lived Wasp family. The R-2800 saw widespread use in many important American aircraft during and after World War II. During the war years, Pratt & Whitney continued to develop new ideas to upgrade the engine, including water injection for takeoff in cargo and passenger planes and to give emergency power in combat. First run in 1937,</ref>, near the time that the competing, larger displacement (at 54.9 litres), 18-cylinder Wright Duplex Cyclone twin-row radial engine's development had been started in May of that year with its own first flight in 1941, the 46-litre displacement R-2800 was the United States's first-flown 18-cylinder radial engine design by 1940. The Double Wasp was more powerful than the world's only other modern eighteen, the Gnome-Rhône 18L of 3,442 in³ (56.4 L). [nb 1] The Double Wasp was much smaller in displacement than either of the other 18-cylinder designs, and heat dissipation was a greater problem. To enable more efficient cooling, the usual practice of casting or forging the cylinder head cooling fins that had been effective enough for other engine designs was discarded, and instead, much thinner and closer-pitched cooling fins were machined from the solid metal of the head forging. The fins were all cut at the same time by a gang of milling saws, automatically guided as it fed across the head in such a way that the bottom of the grooves rose and fell to make the roots of the fins follow the contour of the head, with the elaborate process substantially increasing the surface area of the fins. The twin distributors on the Double Wasp were prominently mounted on the upper surface of the forward gear reduction housing - with one of the pair of magnetos mounted between them on most models - and almost always prominently visible within a cowling, with the conduits for the spark plug wires emerging from the distributors' cases either directly forward or directly behind them, or on the later C-series R-2800s with the two-piece gear reduction housings, on the "outboard" sides of the distributor casings. When the R-2800 was introduced in 1939, it was capable of producing 2,000 hp (1,500 kW), for a specific power value of 0.71 hp/in³ (32.6 kW/L). The design of conventional air-cooled radial engines had become so scientific and systematic by then, that the Double Wasp was introduced with a smaller incremental power increase than was typical of earlier engines. Nevertheless, in 1941 the power output of production models increased to 2,100 hp (1,600 kW), and to 2,400 hp (1,800 kW) late in the war. Even more was coaxed from experimental models, with fan-cooled subtypes like the R-2800-57 producing 2,800 hp (2,100 kW), but in general the R-2800 was a rather highly developed powerplant right from the beginning. The R-2800 powered several types of fighters and medium bombers during the war, including the U.S. Navy's Vought F4U Corsair, with the XF4U-1 first prototype Corsair becoming the first airframe to fly (as originally designed) with the Double Wasp in its XR-2800-4 prototype version on May 29, 1940, and the first single-engine American fighter plane to exceed 400 mph (640 km/h) in level flight during October 1940. The R-2800 also powered the Corsair's naval rival, the Grumman F6F Hellcat, the U.S. Army Air Forces' Republic P-47 Thunderbolt (which uniquely, for single-engined aircraft, used a General Electric turbocharger), the twin-engine Martin B-26 Marauder and Douglas A-26 Invader, as well as the first purpose-built twin-engine radar-equipped night fighter, the Northrop P-61 Black Widow. When the US entered the war in December 1941, designs advanced rapidly, and long-established engines such as the Wright Cyclone and Double Wasp were re-rated on fuel of much higher octane rating (anti-knock value) to give considerably more power. By 1944, versions of the R-2800 powering late-model P-47s (and other aircraft) had a rating (experimental) of 2,800 hp (2,100 kW) on 115-grade fuel with water injection. 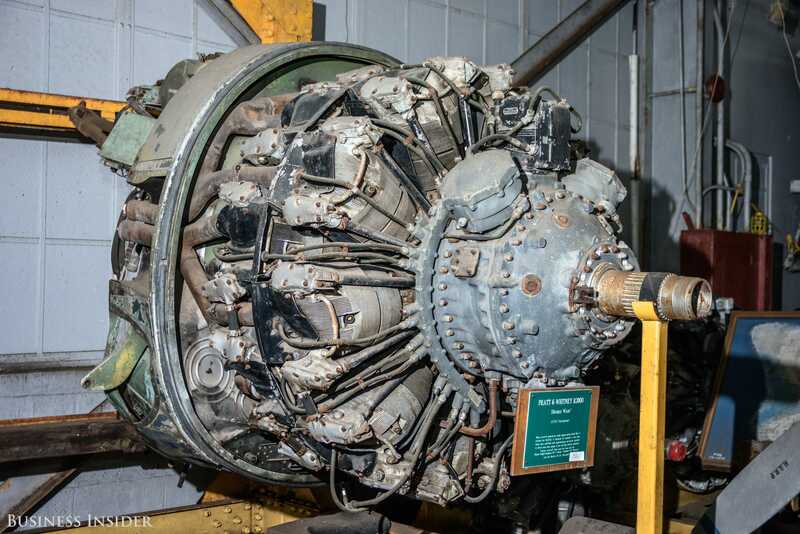 After World War II, the engine was used in the Korean War, and surplus World War II aircraft powered by the Double Wasp served with other countries well past the Korean War, some being retired as late as the latter part of the 1960s when the aircraft were replaced. Engines grow in power with development, but a major war demands the utmost performance from engines fitted to aircraft whose life in front-line service was unlikely to exceed 50 hours flying, over a period of only a month or two. In peacetime however, the call was for reliability over a period of perhaps a dozen years, and the R-2800's reliability commended its use for long-range patrol aircraft and for the Douglas DC-6, Martin 4-0-4, and Convair 240 transports. The last two were twin-engine aircraft of size, passenger capacity, and high wing loading comparable to the DC-4 and the first Constellations. Today, three-quarters of a century after the first prototype Double Wasp, it still flies in restored vintage warbird aircraft displayed at air shows, and sees service worldwide on aircraft such as the Canadair CL-215 water-bomber. In addition, R-2800s continue to power DC-6 cargo and fuel-carrying aircraft in locations such as Alaska. A total of 125,334 R-2800 engines were produced between 1939 and 1960. This is a list of representative R-2800 variants, describing some of the mechanical changes made during development of the Double-Wasp. Power ratings quoted are usually maximum "military" power that the engine could generate on takeoff and at altitude: 100 Octane fuel was used, unless otherwise noted. Suffixes such as -S14A-G denote engines developed for export to other countries. The dash number for each military type (e.g. : -21) was allocated to identify the complete engine model in accordance with the specification under which the engine was manufactured, thus it did not necessarily indicate the sequence in which the engines were manufactured; for example: the -18W was a "C" series engine, built from 1945, whereas the -21 was a "B" series engine, built from 1943. The suffix W e.g. : -10W denotes a sub-series modified to use A.D.I Anti-Detonant Injection or water injection equipment, using various mixes of water and methyl alcohol (CH3OH) injected into the carburetor to increase power for short periods: several models of R-2800s were fitted as standard with A.D.I and did not use the W suffix. [nb 2] Few commercial aircraft used water injection. 1,500 hp (1,118 kW) at 2,400 rpm at 7,500 ft (2,286 m). Production prototype of "A" series engines with the first flight test July 29, 1939. Single-speed two-stage supercharger. Production = 2 (P&W). Tested in Vultee YA-19B. 2,000 hp (1,491 kW) at 2,700 rpm at 1,000 ft (305 m); 1,800 (1,342 kW) at 2,700 rpm at 15,500 ft (4,724 m); up to 2,250 hp (1,677 kW) WEP with water injection. Similar to -8 series apart from downdraft PT-13G2-10 and PT-13G6-10 (-10W) carburetor. Used in Curtiss XP-60E, Grumman F6F-3 (-10; late production -10W) and F6F-5 (-10W) series and Northrop XP-61, YP-61, and P-61A-1. Production = 4,621 -10 (P&W 2,931; Nash 1,690) and 12,940 -10W (P&W 3,040; Nash 9,900); Total = 17,561. A "C Series" R-2800, with the two section nose casing incorporating torque-monitoring equipment and a Spark Advance unit, with the "outboard" sparkplug wiring conduit location for each of the twin enclosed distributors. 2,100 hp (1,566 kW) at 2,800 rpm at 1,000 ft (305 m); 1,800 hp (1,342 kW) at 2,800 rpm at 25,500 ft (7,772 m). First series production variant of the "C" Series, which was a complete redesign of the R-2800. Some of the main changes were forged, rather than cast cylinders, allowing an increased compression ratio (from 6.65:1 to 6.75:1), a redesigned crankshaft, a single piece, rather than split crankcase center section, and a two section nose casing, incorporating hydraulically operated torque-monitoring equipment and an automatic, vacuum operated spark-advance unit. The supercharger used fluid coupling for the second stage. Updraft Bendix-Stromberg PT-13G2-10 carburetor. Used in Vought F4U-4 and -4 variants. [nb 6] Production = 3,257 (P&W). There is a R-2800-39 on display at the New England Air Museum, Bradley International Airport, Windsor Locks, CT.
A R-2800-8W Double Wasp is on display at the Flying Leatherneck Aviation Museum at MCAS Miramar, California. Workers assembling the cylinders on an early production R-2800: this was either a training session or a test assembly of a pre-production engine. ^ The American Wright Duplex-Cyclone radial of 3,347 in³ (54.86 L) was also under development at the time, and promised to be more powerful than either the P&W or Gnome-Rhone radials. ^ P&W authorised the use of 50% methanol, 50% water or combinations of 60% methyl-40% water; or 25% methyl-25% ethyl alcohol-50% water; or 60% methol-39% water plus 1% anti-corrosive oil. ^ The placard on this R-2800, photographed in the National Museum of the United States Air Force says that this is a -21, built by Ford in 1943: components such as ignition harnesses were interchangeable between the likes of -21 and -59 series engines. ^ Prototype and production prototypes were the "A" series R-2800-17 (one built) and R-2800-35 (11 built), fitted to the XP-47B and early P-47Bs respectively. ^ R-2800-63 with small manufacturing differences was interchangeable with -21 or -59 . Production =2,092 (P&W 1,262; Ford 767). ^ Because the "C" series engines ran more smoothly than previous R-2800s the F4U-4 was able to use simplified, solid engine mountings rather than needing mountings incorporating shock absorbers. ^ "B-29 Design/Devemopment - Engines". 468thbombgroup.org. Retrieved August 1, 2013. ^ McCutcheon, Kimble. "No Short Days - The Struggle to Develop the R-2800 "Double Wasp" Crankshaft - Introduction" (PDF). enginehistory.org. p. 4. Retrieved August 1, 2013. ^ a b c d Pratt and Whitney R-2800 The Aviation History Online Museum. Retrieved: 23 February 2009. ^ "ConnecticutCorsair.com's R-2800 Overhaul Manual (archived Pratt & Whitney maintenance/overhaul manual for R-2800 Double Wasp)". ConnecticutCorsair.com. Connecticut Corsair LLC. Retrieved April 23, 2015. From numbered callouts for photo: "3. Distributor Housing Cover, 16. Distributor Housing"
^ A preserved "C-Series" Double Wasp, with the "outboard" wire exits from the distributor cases. ^ "Chance Vought F4U Corsair - XF4U-1 - Genesis". f4ucorsair.com. f4ucorsair.com. Archived from the original on July 13, 2013. Retrieved August 9, 2013. ^ "Chance Vought F4U Corsair - XF4U-1 - Testing". f4ucorsair.com. f4ucorsair.com. Archived from the original on July 13, 2013. Retrieved August 9, 2013. ^ White 2001, p. 218. ^ White 2001, p. 100. ^ White 2001, p. 249. ^ White 2001, p. 250. ^ a b c White 2001, pp. 251-252. ^ Bodie 1994, p. 387. ^ White 2001, pp. 257, 269, 387. ^ White 2001, p. 260. ^ Bodie 1994, p. 392. ^ a b White 2001, p. 280. ^ USN history 1986, p. 8. ^ White 2001, pp. 163-165, 167-169. ^ White 2001, pp. 144-145, 148-152, 158-160. ^ White 2001, pp. 432, 437. ^ White 2001, p. 257. ^ http://neam.org/index.php?option=com_content&view=article&layout=edit&id=1093 "Pratt & Whitney R-2800-39 Double Wasp"
Wikimedia Commons has media related to Pratt & Whitney R-2800.